Funktional Art has begun a new mural. 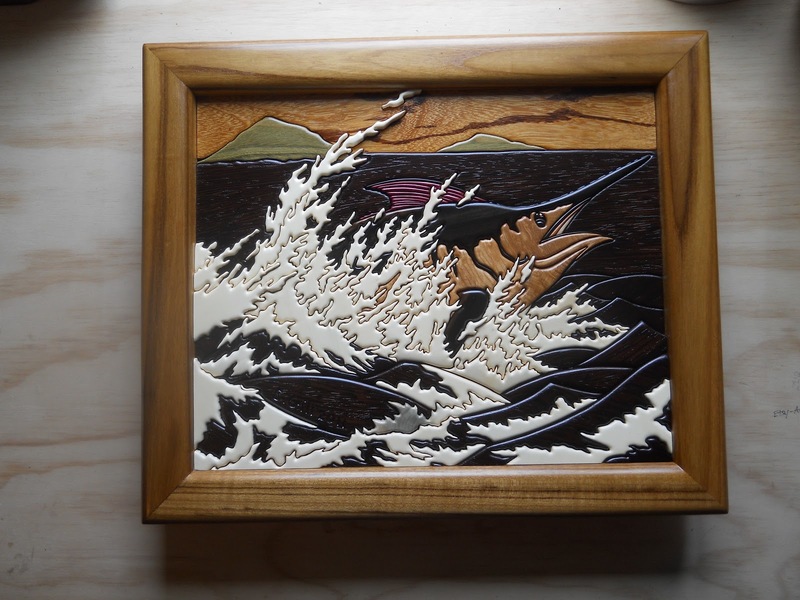 Commissioned to go in the salon of a sport fishing yacht, this piece depicts a large tuna chasing a school of dorado. The dorado are made of a variety of species of wood ranging in colors from yellow to orange, green to purple and some faint shades of blue. 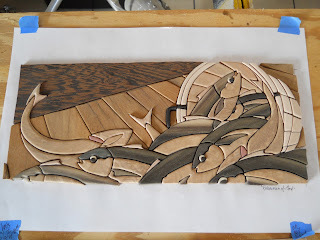 The tuna will become a focal point as it compliments the bright colors of the dorado with deep purple hues, pinks, yellows and hints of green. 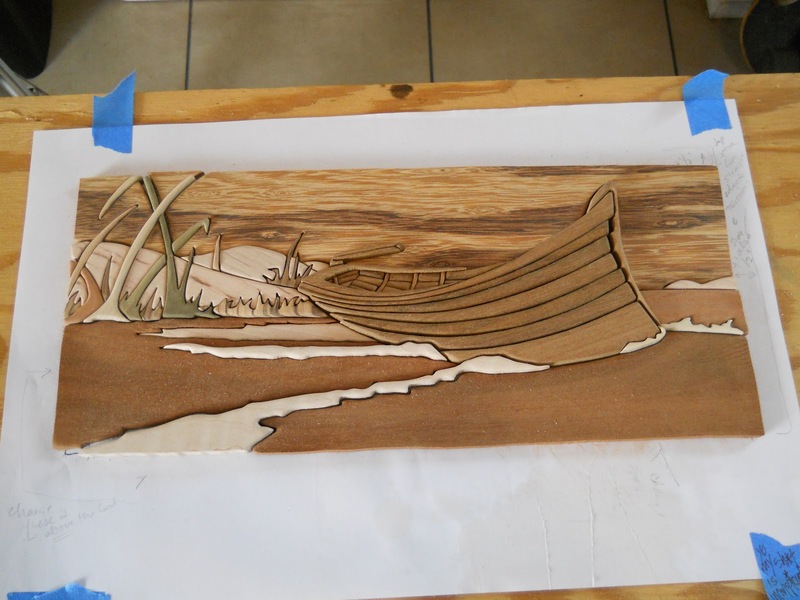 Stay posted to see updated pictures under "works in progress". 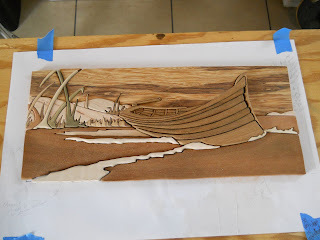 To view more progress pictures click on works in progress. 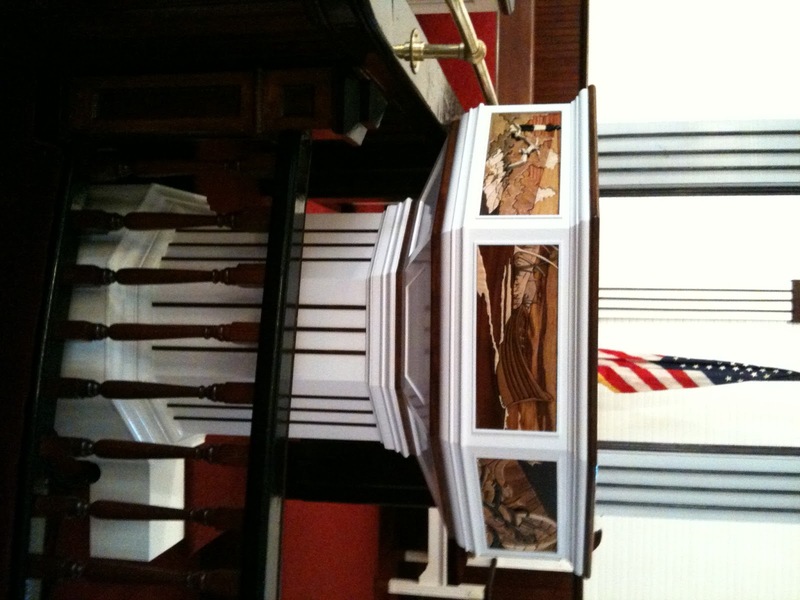 Funktional Art was recently commissioned to produce five inlays for the pulpit of the Bethany United Methodist Church in Wanchese, North Carolina. 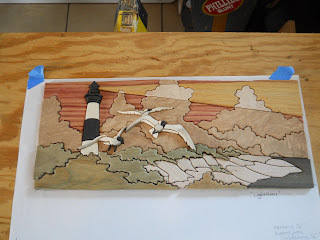 The inlays depict a shad boat, the Bodie Island lighthouse, fish spilling from a basket and there are two decorative side panel inlays. These inlays are 6" x 14" and fit into the custom made pulpit. Peter Wright, editor at large of Marlin Magazine, commissioned this mural of a black marlin. 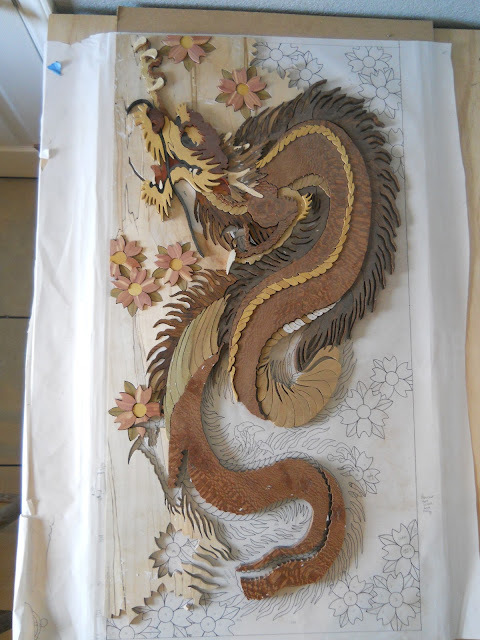 Finished in March, this piece is smaller in scale, only 20" x 18". 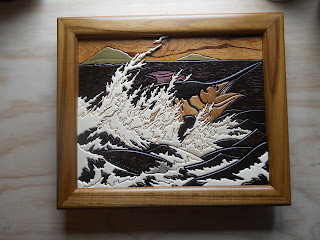 The power and majesty of the black marlin is depicted in this mural as he bursts through the surface of the water sending ocean spray into the sky. During a trip to Florida over Christmas, Peter Wright editor at large of Marlin Magazine, was kind enough to introduce us to a few of the custom yacht builders along Florida's east coast. We started off in Stuart and worked our way to Fort Lauderdale and Miami. Please feel free to contact me with any questions or inquiries. 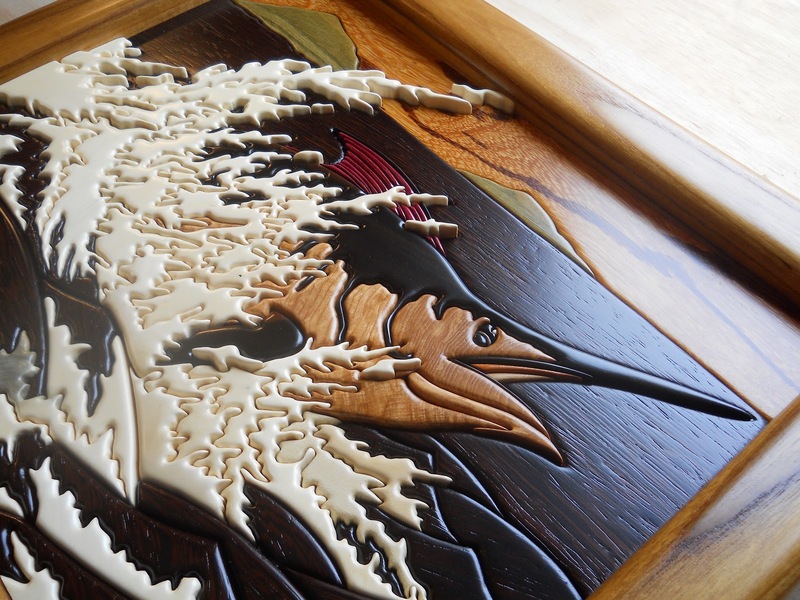 Sarah Gill, artist/owner, is a graduate of East Carolina University. Sarah has a Bachelors of Fine Arts with an emphasis in Wood Design. 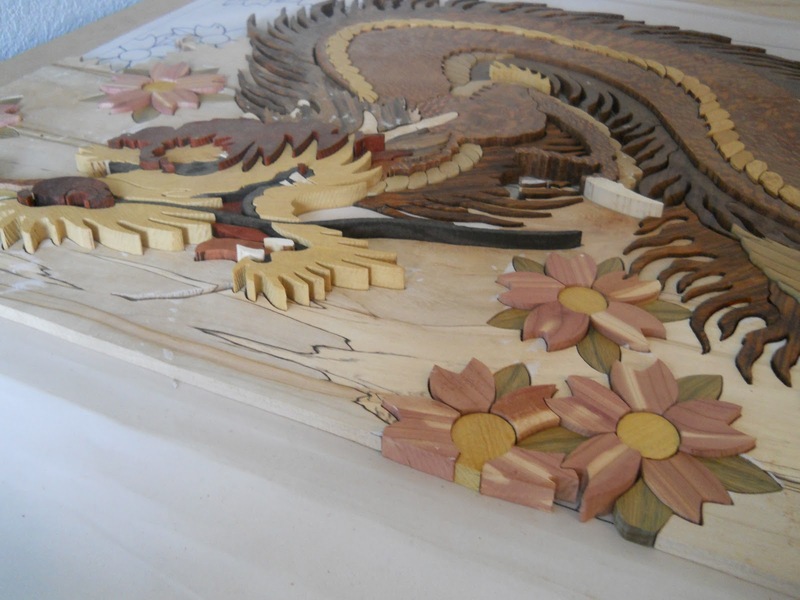 She has also attended a number of classes offered through Arrowmont School of Arts and Crafts in Gatlinburg, Tennessee which include wood turning, wood carving and sculpture, and furniture making. 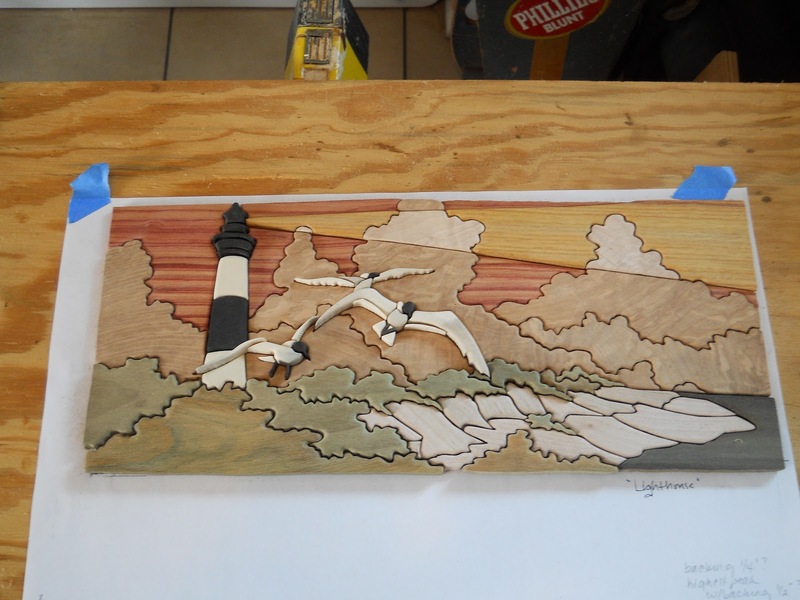 After graduating college, Sarah worked with a custom furniture business on the Outer Banks of North Carolina for a little over a year before branching out into her own business, Funktional Art. Her first commissioned murals were created in 2004 when the State of North Carolina hired Funktional Art to build three 7'x 3.5' murals that depicted native species to the region for the North Carolina Wildlife Educational Center located next to the Whalehead Club in Corolla, NC. 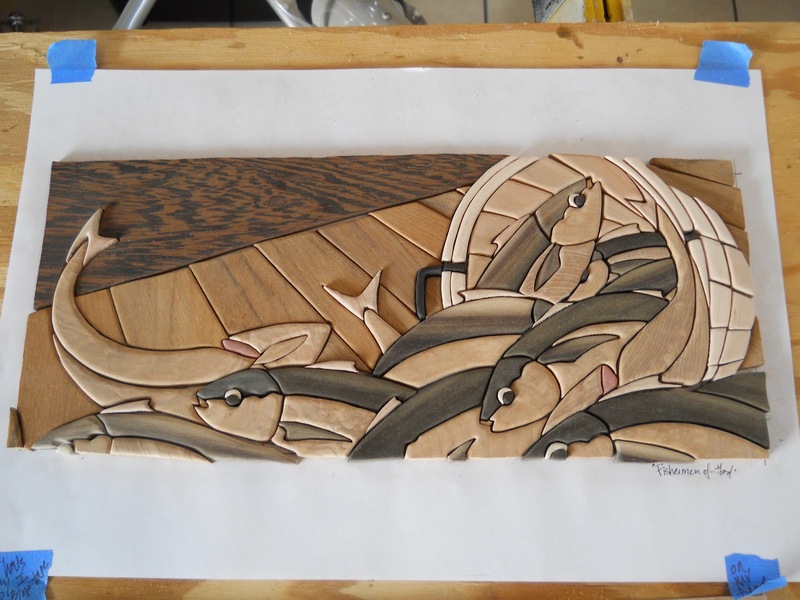 Since then, Funktional Art has collaborated with Bayliss Boatworks out of Wanchese, NC to create custom murals featured in custom sportfishing yachts such as the "Uno Mas". 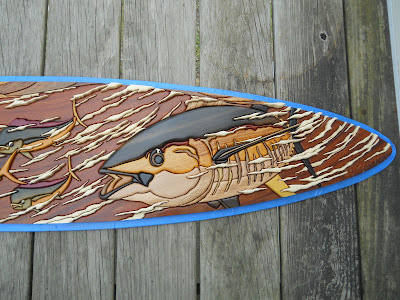 Funktional Art had the honor of attending the 2010 Boat Show where one of our most recent murals was featured on the "Uno Mas". The "Uno Mas" is Bayliss Boatworks most recent custom sportfishing yacht and proved herself to be a real show-stopper. Sarah Gill (right) with her sister aboard the "Uno Mas"